The number of infants with head shape deformities has risen over the past several years, likely due to increased awareness of the “Back to Sleep” program. Most of the time, the head deformity is simply positional plagiocephaly, a benign condition that does not require surgical intervention. However, some deformities are caused by craniosynostosis, a condition where skull sutures fuse prematurely. Craniosynostosis must be ruled out because it has significant medical implications. Early diagnosis and treatment of craniosynostosis improves outcomes and reduces possible adverse effects on brain development. The sutures of the skull serve as growth plates that allow the skull to grow as the brain grows. In craniosynostosis, one or more of the sutures close early. The skull then attempts to grow parallel to the fused suture, rather than perpendicular to it, causing an abnormal head shape. Occurring in one out of 2,000 to 2,500 live births, craniosynostosis may be spontaneous, syndromic or familial and can present in many different forms. 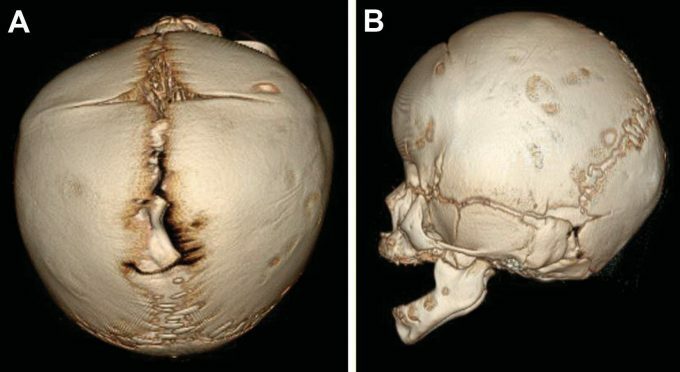 Left untreated, craniosynostosis can result in further cranial deformity and potentially an overall restriction in head growth, with secondary increased intracranial pressure. It can also lead to psychosocial issues as the child interacts with peers during development. Multiple types of surgical intervention for craniosynostosis exist. 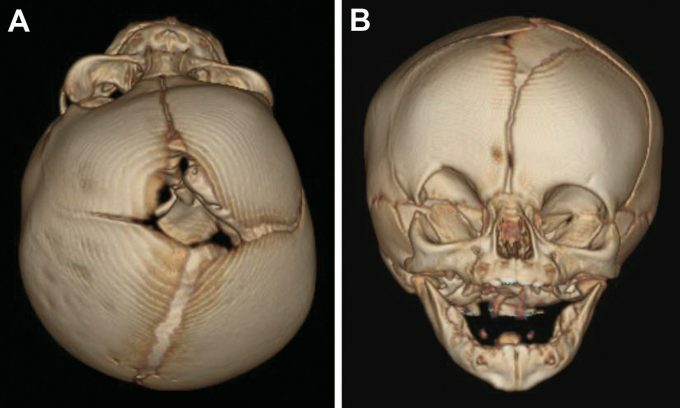 Connecting patients with a pediatric craniofacial center as early as possible is essential as it allows all options to be offered. Normal sutures include the metopic (m), coronal (c), sagittal (s), lambdoid (I) and squamosal (sq). In craniosynostosis, the anterior fontanel (af) may be open or closed. 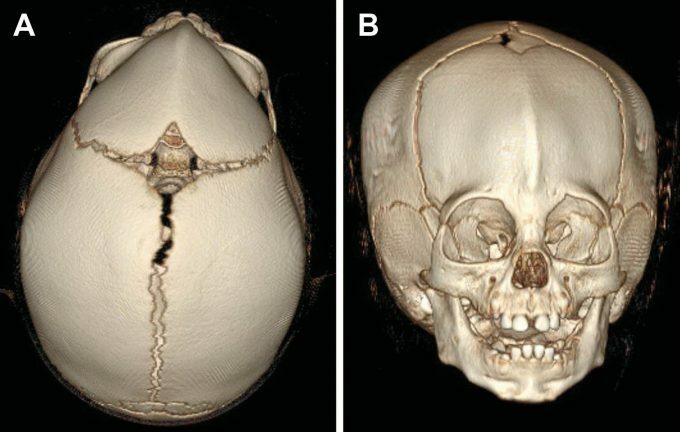 In positional plagiocephaly, the skull sutures are not fused. This head shape deformation, typically of the back of the head, is caused by repeated pressure to the same area. It usually develops when a child prefers to lay his or her head on the same spot. Torticollis or gross motor delay can also contribute, and these conditions may be responsive to physical therapy. Effects of positional plagiocephaly are primarily cosmetic, as the condition does not impact brain growth or development. Positional plagiocephaly can often be treated by the child’s primary care physician. It usually does not require an appointment with a specialist; however, specialist consultation is always available if there are concerns. Positional plagiocephaly is different than craniosynostosis. In positional plagiocephaly, the ear and possibly forehead on the side of the posterior flattening are displaced anteriorly, giving the head a parallelogram shape. Flattening may occur on the right, left or center occiput. 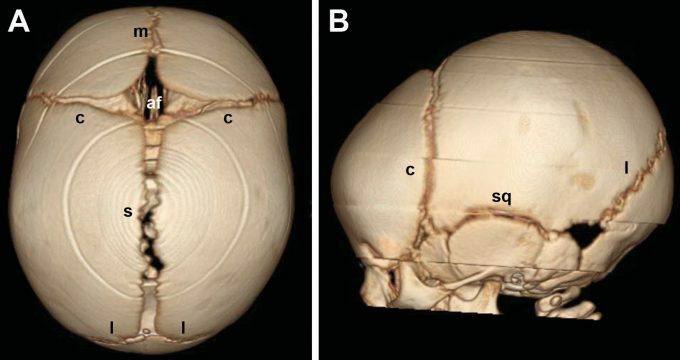 Symmetric positional plagiocephaly can sometimes be difficult to distinguish from bilateral coronal craniosynostosis and imaging may be considered. The most apparent sign of craniosynostosis is typically an abnormally-shaped head. The soft spot may be open or closed. Less common is a restriction of head growth with the measurements “falling off” the pediatrician’s growth curves. Most often, an examination of head shape can differentiate craniosynostosis from positional plagiocephaly. Head shapes are best viewed by standing above and looking down at the top of a child’s head. In the case of an unclear diagnosis, a four-view skull X-ray series or head CT with 3-dimensional reconstructions of the bone windows can be used to see if sutures are fused. If the sutures are patent, then there is no craniosynostosis. Ultra low-dose CT scanning at pediatric craniofadal centers can provide 3D images at radiation dose similar to plain X-rays. 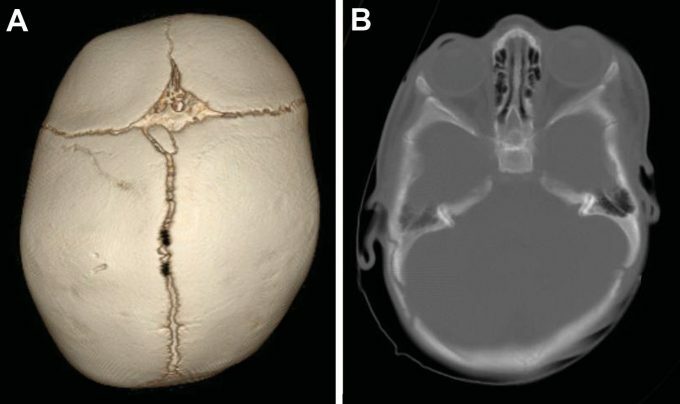 Sagittal craniosynostosis, the most common non-syndromic form, causes a long and narrow head. There may be prominence, or “bossing”, of the forehead and/or occiput. Bilateral coronal craniosynostosis, the most common syndromic form, causes a short and wide head. 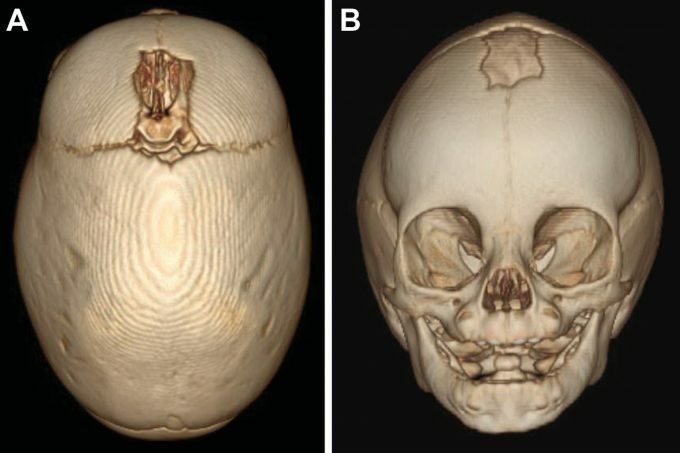 Unilateral coronal craniosynostosis causes a rotated appearance of the face, with flattening of the forehead and elevation of the orbital roof on the affected side along with rotation of the nose. Sometimes the anterior fontanel is somewhat displaced to the contralateral side. the side of the posterior flattening are displaced posteriorly, giving the head a trapezoidal shape. In most infants, the cause of craniosynostosis is unknown and the child is otherwise healthy. Risk factors for craniosynostosis include fetal constraint (null parity, plurality, macrosomia), low birth weight, preterm delivery, maternal valproate use and shunted hydrocephalus. While the majority of cases (approximately 82 percent) are not syndromic or familial, craniosynostosis can be a feature of many different genetic syndromes. It is important for the child to be examined carefully for signs of an inherited genetic disorder, such as facial anomalies, limb defects, hearing loss or cardiovascular malformations.Syndromes that can show craniosynostosis include: Apert, Crouzon, Pfeiffer, Muenke, Saethre-Chotzen, Antley-Bixler, and frontonasal dysplasia. The goals of craniosynostosis surgery are to unlock and reshape the bones. 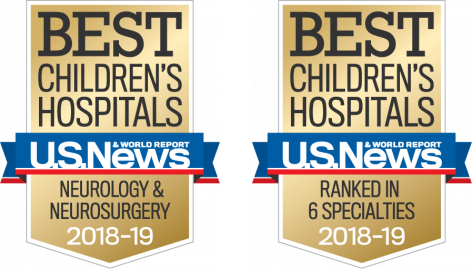 Historically, craniosynostosis has been treated using surgical methods that involve an incision from ear to ear and the removal, reshaping and reattachment of affected bones. 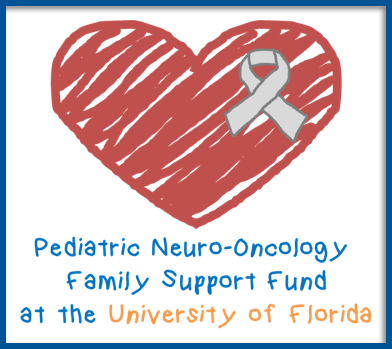 However, at UF Health Shands Children’s Hospital, advances in technology are allowing us to conduct more of these procedures in a minimally invasive manner. With traditional surgery, the procedure lasts approximately four hours and is performed in conjunction with a craniofacial plastic surgeon. A blood transfusion is often necessary. The child is typically observed overnight in the ICU and then an additional three days on the regular neurosurgical floor before discharge. Pronounced periorbital edema is normal, but generally resolves before discharge. To reduce surgical risk, this procedure is performed around the age of 6 months. Younger infants are very unlikely to experience increased intracranial pressure before then. Syndromic and multiple suture cases are more frequently treated using traditional surgical techniques. Because reshaping occurs at the time of surgery, no further interventions are required. Minimally invasive surgery involves two small incisions and the removal of only the fused suture to unlock the bones. The surgery lasts approximately one hour and rarely requires a blood transfusion. Postoperatively, the child is observed overnight on the regular neurosurgical floor and is then discharged. Usually, there is no periorbital swelling. Minimally invasive surgery produces the most successful outcomes when performed on children before the age of 6 months. 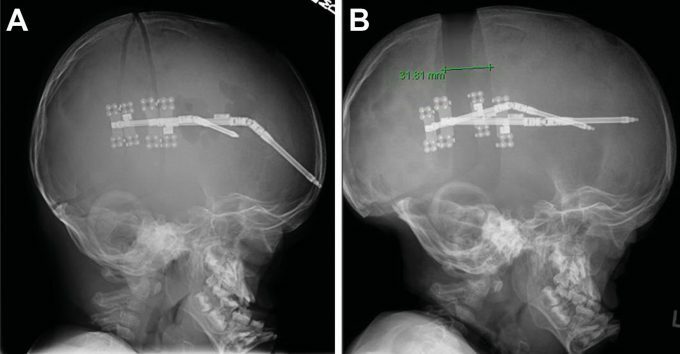 With minimally invasive techniques, reshaping occurs postoperatively with the assistance of either a cranial molding helmet or implanted custom springs. The cranial molding helmet has a hard outer shell with moldable foam on the inside. It is worn 23 hours per day until the child’s first birthday. The helmet does not press the skull into shape but rather directs the growth of the skull into a more normal shape. Because the helmet relies on the high rate of skull growth in the first year of life, helmet-assisted surgery should be done between 10 to 14 weeks of age. The helmet requires frequent visits to an orthotist but no additional surgery. Stainless steel cranial expander springs are implanted after the fused suture is resected. The springs are then removed three months later. The level of spring tension is selected based on the patient’s age, bone thickness and deformity severity. Spring-assisted surgery is performed between the ages of 3 to 6 months. The springs require a second surgery for removal but not the use of the helmet. In some cases, when multiple sutures are fused, cranial distraction can be employed to create more intracranial volume. After the bones are unlocked, distractors are implanted spanning the bone cut At a rate of 1mm per day, the sides are separated by turning the screw that connects them using posts that project through the skin. After 30 days, distraction osteogenesis results in 3 cm of new bone. The posts are then removed and the skin is closed in the office .Three months later, the distractors are removed at a second surgery. Increase the amount of supervised tummy time for their infant while he/she is awake. Place colorful items on the outside of the crib to encourage baby to look in the direction opposite the flattened side. Vary the position of the head when the child is being held. Parents should be advised to continue placing their baby on his or her back to sleep, even if the child has positional plagiocephaly. The flattening is likely to diminish as the child obtains gross motor milestones and lies on the area less. It should also be noted that after the age of 1, it becomes increasingly difficult to modify a child’s head shape non-invasively. If head shape is not responding to traditional conservative treatment, parents can discuss the pros and cons of using physical therapy and/or a helmet with their pediatrician.